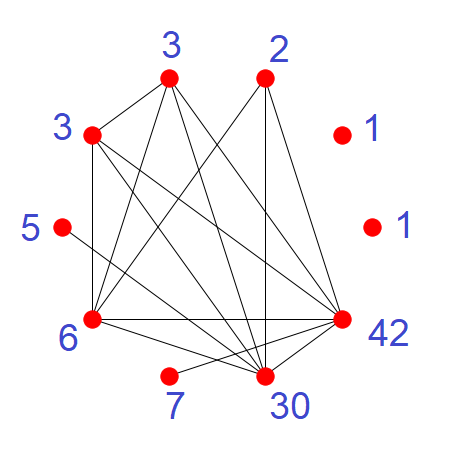 Label the vertices of this graph with positive integers (repetitions allowed) whose sum is 100 in such a way that any pair of vertices are joined by an edge if (and only if) they have labels with a common divisor greater than 1 (i.e. they are not relatively prime). Starting from the lonely vertices and working clockwise: $1, 1, 42, 30, 7, 6, 5, 3, 3, 2$. For convenience, let us label these vertices A, B, C, D, E, F, G, H, I, J. 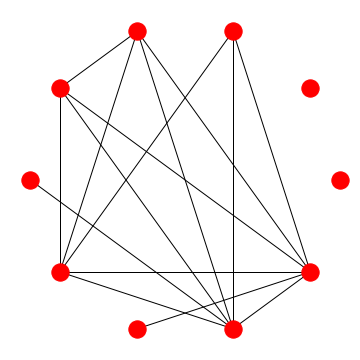 For every $K_n$ subgraph (set of n vertices in which all vertices are connected to each other), it's vertices must all share a unique prime factor that no other vertex outside this set has (Edit: OK this isn't always true, but it does help to use each prime to fill in each $K_n$). Notice the $K_5$ subgraph (CDFHI). To minimize the sum, assign a factor of $2$ to each. Then, each vertex of the nearby $K_4$ (CDFJ) can be assigned factor of $3$, and the two $K_2$s (DG, CE) factors of $5$, and $7$, in some order (It won't matter: C and D are both part of the $K_5$ and $K_4$). This gives a sum of $97$, but we cannot get to $100$ with the last two vertices. Trying another path, we give the $K_5$ vertices a factor of $3$ instead, and the $K_4$ a factor of $2$. This bumps the sum to $98$, where we can now assign $1$s to the lone remaining vertices. Not the answer you're looking for? Browse other questions tagged calculation-puzzle no-computers number-theory graph-theory or ask your own question.